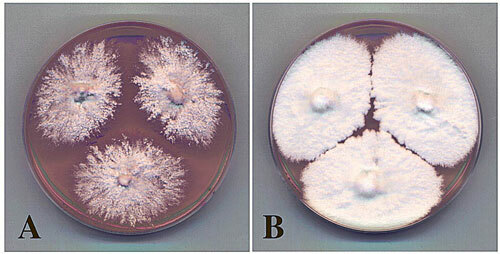 (Nanowerk News) Fungi, with the exception of shitake and certain other mushrooms, tend to be something we associate with moldy bread or dank-smelling mildew. But they really deserve more respect. Fungi have fantastic capabilities and can be grown, under certain circumstances, in almost any shape and be totally biodegradable. And, if this weren’t enough, they might have the potential to replace plastics one day. The secret is in the mycelia. Union College Biology Professor Steve Horton likens this mostly underground portion of fungi (the mushrooms that pop up are the reproductive structures) to a tiny biological chain of tubular cells. Fungi have fantastic capabilities and can be grown, under certain circumstances, in almost any shape and be totally biodegradable. And, if this weren’t enough, they might have the potential to replace plastics one day. Looking something like extremely delicate, white dental floss, mycelia grow in, through and around just about any organic substrate. Whether it’s leaves or mulch, mycelia digest these natural materials and can also bind everything together in a cohesive mat. And these mats can be grown in molds, such as those that might make a packing carton. Ecovative Design, in Green Island, N.Y., is harnessing this particular mycological power and is being helped by Horton, and another Union researcher, Ronald Bucinell, associate professor of mechanical engineering. Ecovative uses several species of fungi to manufacture environmentally-friendly products. The process starts with farming byproducts, like cotton gin waste; seed hulls from rice, buckwheat and oats; hemp or other plant materials. These are sterilized, mixed with nutrients and chilled. Then the mycelia spawn are added and are so good at proliferating that every cubic inch of material soon contains millions of tiny fungal fibers. This compact matrix is then grown in a mold the shape of whatever item Ecovative is making. Once the desired texture, rigidity and other characteristics of the product are achieved, it’s popped from its mold and heated and dried to kill the mycelia and stop its growth. The all-natural products, the creation of which can take less than 5 days, have no allergy concerns and are completely non-toxic. More impressive is the fact that they’re also impervious to fire (to a point), and just as water resistant as Styrofoam, but they won’t sit around taking up space in a landfill. They are also more UV-stable than foam since they are not petrochemical-based, and won’t emit volatile organic compounds. When exposed to the right microbes, they will break down in 180 days in any landfill or backyard. Mycelium is comparatively inexpensive too as it can grow on farm waste that can’t be fed to animals or burned for fuel. Better yet, the fungi can be propagated without sunlight or much human oversight in simple trays at room temperature – no immense greenhouses with costly temperature-control systems needed. It also means a smaller carbon footprint and Ecovative is hoping to the point where they can displace all plastics and foams in the market. And this is where Union professors and researchers, Steve Horton and Ronald Bucinell, are aiding them in this effort. In Horton’s lab, he and his students are tinkering with a species of fungus Ecovative uses in its manufacturing. Associate Professor of Mechanical Engineering Ronald Bucinell and his students also offer critical support to Ecovative’s research and development pipeline. Bucinell’s particular expertise is in experimental mechanics and the mechanics of reinforced materials and is tasked with seeing how strong sample material is under different parameters. This includes determining whether mycelia bind better to one plant material or another; and does the way it’s treated – with heat or something else – make it stronger or weaker. Whether it is packaging or PCR (a genetics tool), the Ecovative founders are grateful for their higher-ed partners.